The intoxicating beauty of towering red rock sandstone monoliths and buttes…. rocks aptly named Coffee Pot Rock and Cathedral Rock…. 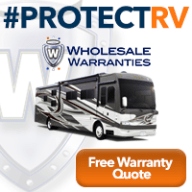 equal parts of rugged and luxury…. a small town blessed with an abundance of beauty and surrounded by National Forest land….. These words barely begin to personify stunning Sedona, Arizona. Sedona served as stop number two for my excursion with my daughter, and as you might expect, it did not disappoint. Ashton was pleasantly awed by the angular rock formations, high mesas, and stunning colors. Talk about a visual treat. A feast for the eyes. An abundance of beauty in all directions. Those beautiful red rocks serve as a backdrop for a number of outdoor activities ranging from spiritual pursuits to hundreds of hiking and biking trails to guided Jeep excursions. Since Ashton and I only had a couple of hours to tour the area, we set our sights on exploring the shops. 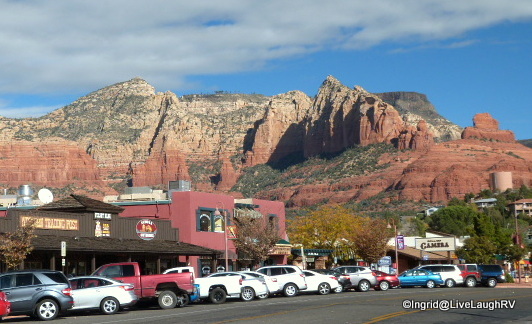 Sedona is well-known for its vortex energy and folks from around the world come here for healing and spiritual renewal. Many of the shops focus on the metaphysical and sell jewelry made from various crystals and stones, each serving a distinct purpose. We stepped into the Sedona Crystal Vortex shop and found ourselves learning the metaphysical value of the array of polished stones. The store offered everything from loose stones, to stunning pieces of jewelry that I would classify as “Art”, to simple elasticized bracelets. As we perused the numerous bracelets, we read the special benefits of wearing particular stones. It seems there’s a stone for whatever ails a person. My skeptical nature may have had me doing an eye roll, but the bracelets were cute and thus I figured what the heck. It certainly couldn’t hurt to wear one of these ‘healing‘ bracelets and I can always use a little help. Hmm….. I pondered which stone(s) would be most beneficial for me; creativity, energizing, harmony, inspiration, courage, grounding, prosperity, calming, balance? The list went on, and although I was tempted to walk out of there with half a dozen bracelets, my wallet thanked me for walking out empty-handed. Perhaps I should have indulged in a citrine stone bracelet = prosperity! Ashton, on the other hand, found healing and inspirational therapy at a wine shop. Following a little wine tasting, she walked out of the store with two bottles of Arizona wines. We spent another hour engrossed in retail therapy before heading off for a little spiritual enlightenment. 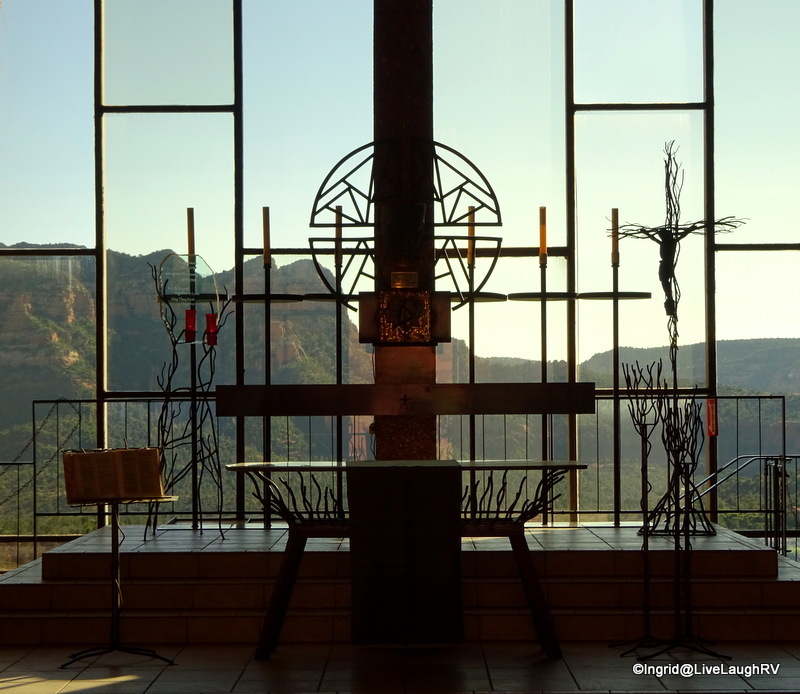 Regardless of one’s faith, a visit to the Chapel of the Holy Cross is a must. 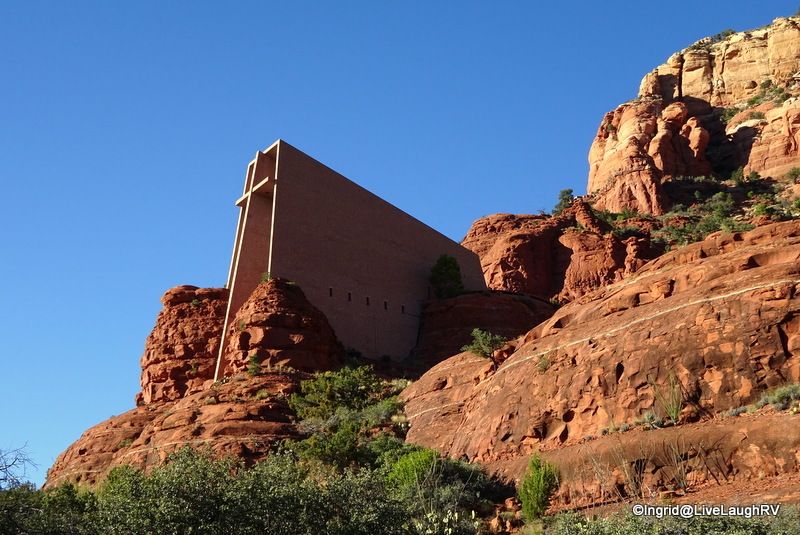 Built in 1956 this Catholic Chapel rises 70 feet (21m) out of a 1,000 foot (300m) red rock cliff. I must admit, a quiet moment of reflection inside this church had more of an impact on my aura than any of the crystals or healing stones I handled that day. Perhaps my chakras are in need of attention. On that note, I know just the place to go to have my chakras aligned, engage in vortex energy, have my aura analyzed, or purchase stones to help heal whatever ails me 😉 Yes, Sedona…. I shall return. I’m itching to hit your trails! Before heading out of town, we made one final stop. Not only had I worked up a thirst, but I felt compelled to show Ashton the architecture on this one of a kind McDonald’s. Yep, this is the only McDonald’s in the world where the arches are turquoise instead of golden. So when I told her we were stopping at the Turquoise Arches for soft drinks, she was initially perplexed and later humored. With trepidation, we hook up, load up and depart Dead Horse Ranch State Park leaving the images of Sedona in the rear view mirror. 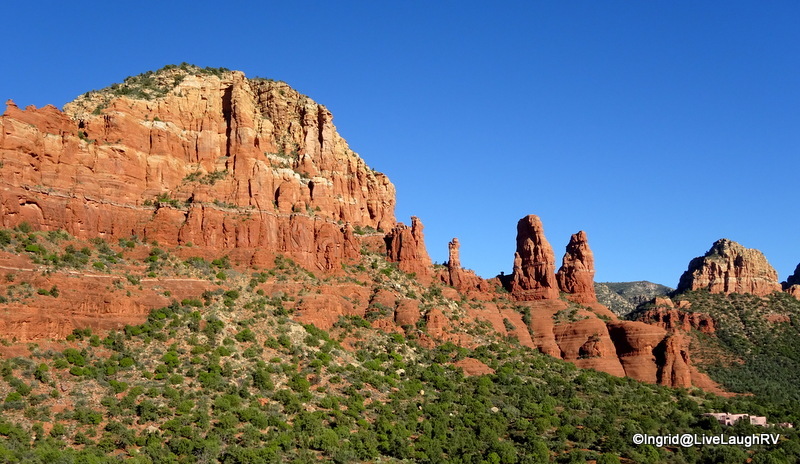 We hated saying good-bye to Sedona’s natural beauty of red-rocks. Many of these red-rock buttes, spires, and monuments have names, such as the popular Coffee Pot Rock. Red Rock Country is definitely worth the visit on any trip to Arizona. I know it’ll be a regular stop for Al and me. We already look forward to returning. And while the red-rocks are majestic and stunning, another site catches our eyes….McDonald’s. Oh, but this McDonald’s is special. 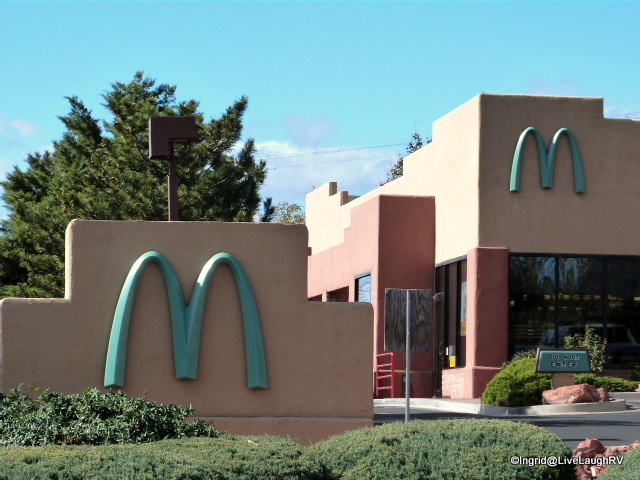 It’s the only one in the world where the Golden Arches are Turquoise Arches. Turquoise is a color most associated with the desert southwest. As I’m taking a photo, a gentleman from Japan joins me to my left, while a woman from Spain joins me on my right. 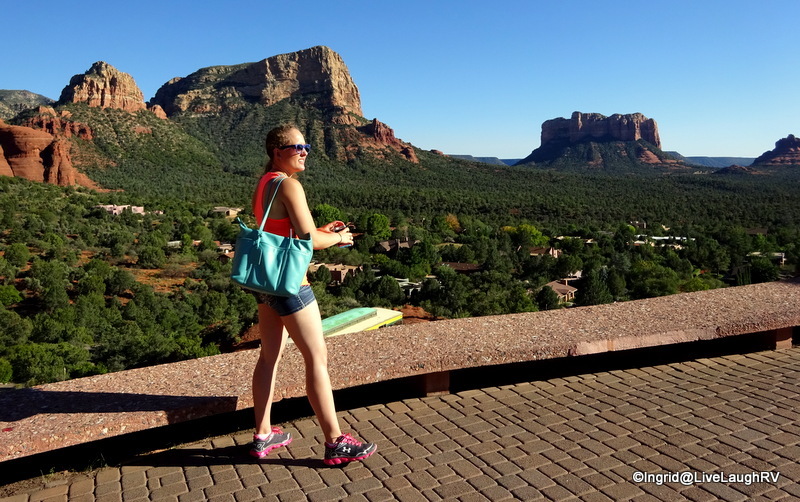 Sedona is a highlight for folks from around the world. We all comment about the Turquoise Arches and the southwest architecture as we snap away. With the Rig pointed south, we slowly meander toward Phoenix. Arizona is a land of contrast and diversity. The scenery is undeniably beautiful, ranging from hot and dry deserts to evergreen mountain forests to towering red rocks and canyon gorges. One minute we’re traveling among ignored, undeveloped desert, the next we stumble across an old pioneer graveyard or ghost town. 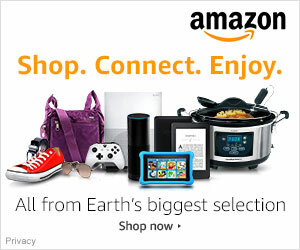 Then within a few short miles, we happen upon a populated area of new homes and shopping centers. It appears everything in Arizona is either very old or very new. What an amazing land. And it’s ours to explore! We awake to a beautiful Arizona sunrise, and quickly ready ourselves for the day. 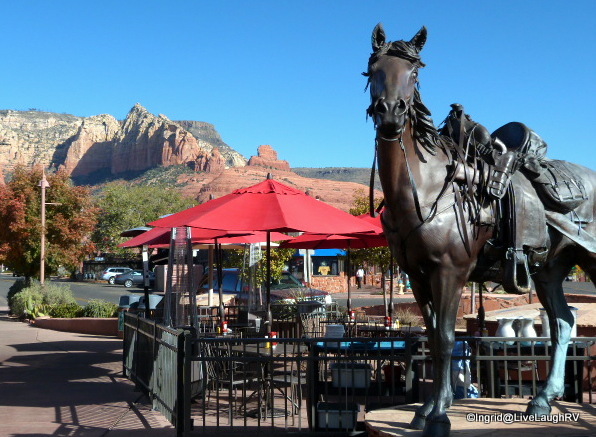 We’re off to try another Sedona recommendation from LuAnn….the Coffee Pot Restaurant. 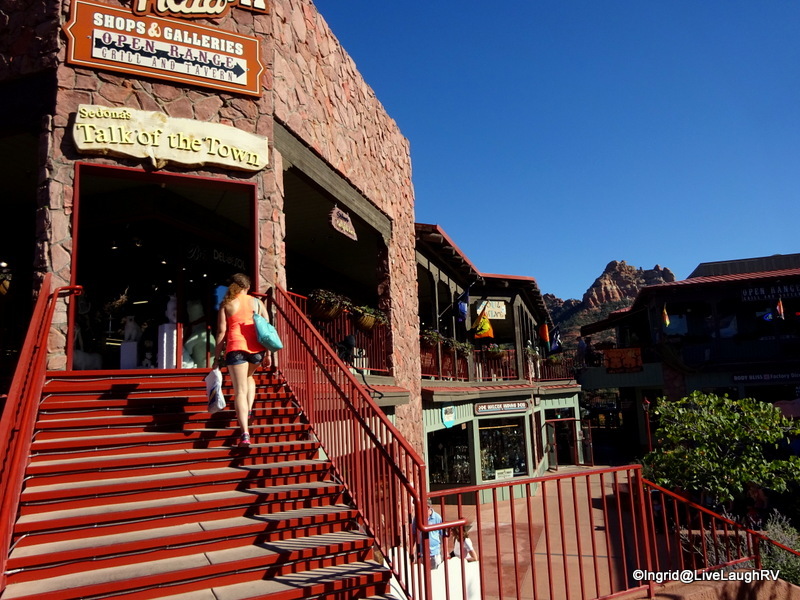 The Coffee Pot Restaurant is home to 101 Omelets and got its name from the famous Coffee Pot Rock. Coffee Pot Rock is actually the highest point in Sedona at about 5,600 feet in elevation. The town sits at 4,350 feet in elevation. Ummm, the coffee was divine and the food was excellent. We even purchase some coffee to brew back at the RV. Next we head into the quaint older shopping district for a little retail therapy. I can’t help but feel a sense of history. I image the pioneers on horseback discovering this majestic land. The history of this land goes way back to various Indian civilizations. 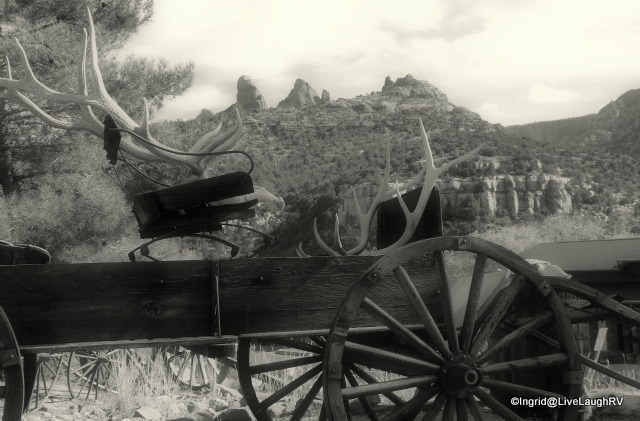 The first Europeans (Spanish) explored the Verde Valley in the mid 1500’s and the first Anglo settled in the area in 1876. Sedona is a small town of about 10,000 residents and consists of 19 square miles, 49% of which belong to the Coconino National Forest. With such an abundance of public access, the availability of hiking is endless. Red Rock Country is stunning in all directions. There’s a sense of spirituality. A majestic beauty. It’s no wonder this unique beauty attracts 2 to 4 million tourists a year. Al and I finally feel rested, relaxed, rejuvenated, and ready to hit the road again. Although I must admit, I could stay for quite awhile and never tire of the view. I’m speaking of the State Park….Dead Horse Ranch State Park located in Cottonwood, Arizona. Quite a name, isn’t it? How the park got its name – The Ireys family came to Arizona from Minnesota looking to buy a ranch in the late 1940’s. At one of the ranches they discovered a large dead horse lying by the road. After two days of viewing ranches, Dad Ireys asked the kids which ranch they liked the best. The kids said, “the one with the dead horse”. 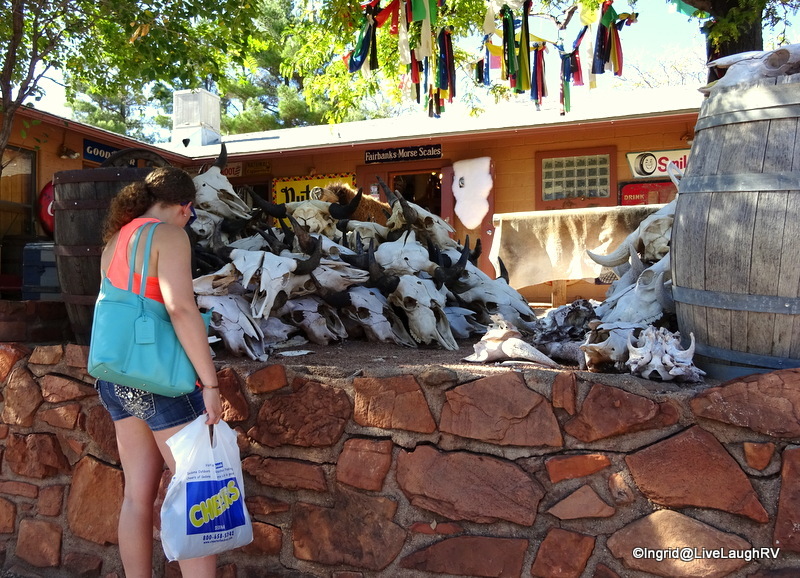 The Ireys family chose the name Dead Horse Ranch and late, in 1973, when Arizona State Parks acquired the park, the Ireys made retaining the name a condition of sale. Dead Horse Ranch State Park covers 423 acres and sits at an elevation of 3,300 feet. The park is located within the Coconino National Forest and provides ample trails for hiking or biking, as well as water for canoeing or fishing. 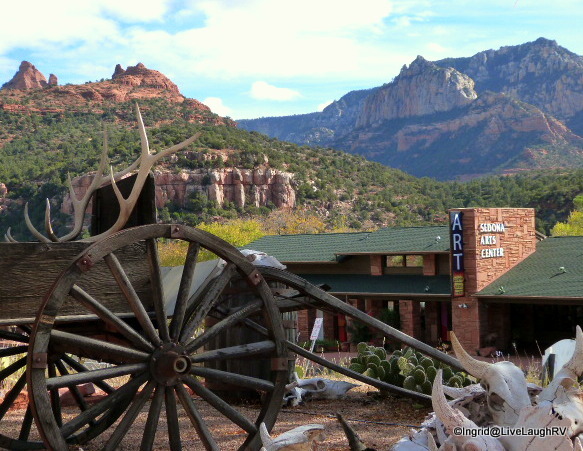 The spiritual town of Sedona is an easy 20 minute drive from Dead Horse Ranch State Park. LuAnn over at Paint Your Landscape graciously sent me information and recommendations on the area. Thank you, LuAnn. Our first stop was Chapel of the Holy Cross. What a fascinating structure. The mere thought of constructing this unique building boggles my mind. After a moment of reflection at the chapel, we stop at an architecturally pleasing shopping center called Tlaqquepaque….no, I don’t know how to pronounce it.